Now you can get a hybrid luxury automobile at the very attractive price point of $38,850, only $2,750 more than the V6 variant on a 40-mpg vehicle. Both the 2013 Lexus ES 350 and ES 300h will arrive at dealerships next month. The ES 350 comes at a base price of $36,100, 1.7 percent less than the previous generation. Both stated prices do not include the $895 delivery, processing and handling fee. Fully loaded totals with prices of individual options are included below. 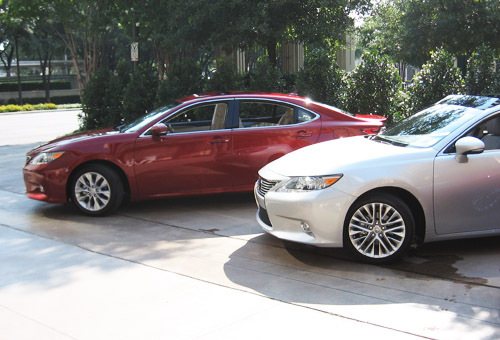 This is the first time the Lexus ES has been available with Lexus Hybrid Drive. It features the proven 2.5-liter four-cylinder Atkinson cycle engine, designed to give the ES 300h an expected EPA fuel economy rating of 40 mpg city and 39 mpg highway with 200 total system horsepower. The ES 350 has a 3.5-liter V6 engine with Dual VVT-i boasting 268 horsepower at 6,200 rpm and 248 lb.-ft. of peak torque at 4,700 revs. The six-speed sequential-shift Electronically Controlled Transmission with intelligence provides lively performance, fuel efficiency and smooth shifts. Low friction materials are used to improve efficiency and help the ES 350 achieve EPA-fuel economy of 21-mpg city, 31-mpg highway, averaging out to about 24-mpg in normal urban driving. Both vehicles come with a drive mode selector, allowing drivers to adjust efficiency, the powertrain and steering responsiveness or even run only the power from the hybrid battery pack for a short distance. In normal mode, the ES 350 is balanced for a blend of performance and efficiency well suited to daily driving. The 2013 Lexus ES 350 and ES 300h both benefit from a more rigid chassis thanks to the use of lightweight, high tensile strength steel, added bracing and extra body welds. The suspension geometry has been revised with shock absorber dampening and a sharper steering gear ratio deliver precise handling yet greater ride comfort. The ES models feature 10 airbags as standard equipment., but the optional Blind Spot Monitor with Rear Cross Traffic Alert (RCTA) are so valuable to the safety of occupants and those nearby, they are well worth the outlay. The RCTA is an extra set of eyes when backing out of a parking spot. Lane Departure Alert (LDA), integrated with automatic headlamp dimming, is also available. The optional Pre-Collision System uses sub-millimeter wave radar, designed to detect obstructions within the car’s trajectory, to prepare the vehicle’s safety systems for an impending collision. Lexus Safety Connect is offered on all new Lexus vehicles with a one-year trial subscription, comprised of a suite of features including Enhanced Roadside Assistance, an Emergency Assistance Button (SOS), Stolen Vehicle Location service, and Automatic Collision Notification. The standard Lexus audio set-up features eight-speakers with Automatic Sound Levelizer, CD player, USB/iPod ports, plus integrated SiriusXM Satellite Radio with a 90-day trial subscription included. The available Display Audio package adds a seven-inch screen, HD Radio™ with iTunes tagging, Bluetooth audio, phone book transfer, vehicle information display and a rear backup camera. For the true audiophile, the 15-speaker 835-watt Mark Levinson system featuring an eight-inch display screen and DVD audio/video is an absolute must. Exclusive GreenEdge technology boosts the output to double, while reducing energy consumption by fifty percent. It creates scintillatingly pristine sound reproduction. An optional HDD Navigation System includes voice command, integrated backup camera, eight-inch viewscreen, and the next generation Lexus Enform system with App Suite with a one-year subscription gratis. Lexus Enform connects its suite of apps via your smartphone. Apps are updated through cloud-based downloads, so new apps and content can be added as available. For more information on which best suits you, click here.